To be honest, my solution has been to shelter my children and keep them in a “bubble.” Even though I understand that is not a practical or long term solution, it has been my only perceived option that works. 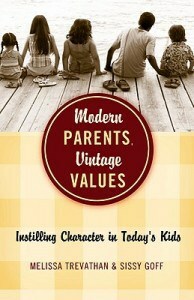 Modern Parents, Vintage Values offers advice and real life solutions to instill values while allowing children to thrive and I found it to be very helpful. My favorite chapter addressed the “Value of Gratitude” which is so important for me to be able to teach to my children. There are times that I feel like this is such a challenge. For example, my five year old son recently went to play at the neighbors house (his first time at a play date without me) and when he came back and I asked him how it went he said, “Mommy, he had so many cool toys and I want this one and that one….” I felt discouraged that my attempts to instill gratitude were not heeded. Modern Parents, Vintage Values includes a handy tip section that has lots of useful suggestions. It made me feel confident in that many of the suggestions are already put into place in our house and it also gave me encouragement to try some new ones too. The authors use biblical solutions for many real life situations without being “preachy” and the suggestions and do-able for real life. I highly recommend this book to any parent who struggles to find a balance to raise thoughtful, moral children with values. It makes me realize there is hope for my family yet! Retails for $14.99 at a bookstore near you or your can purchase at Amazon.com. Judging by the title alone, this is my kind of book.